The PHH-257-KIT is designed for field and laboratory measurement of pH. Supplied as a complete kit, the PHH-257-KIT is perfect for transporting to remote locations, keeping the equipment organized and ready for future measurements. Standard features include automatic buffer recognition and calibration, diagnostic error code display to indicate defective electrodes or incorrect buffer solution. The meter has a very precise 0.1 mV resolution, ideal for ion selective measurements. The PHH-257-KIT comes complete with meter, epoxy-bodied general purpose pH electrode, temperature probe, carrying case and user’s manual. 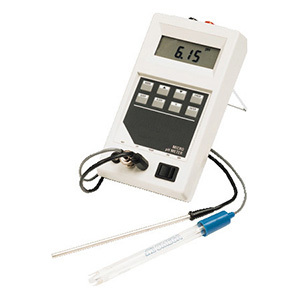 참고: Includes meter, epoxy-bodied general purpose pH electrode, temperature probe, carrying case and operator’s manual.